The Scottish love of the written word is evident everywhere in Edinburgh. The train station, Waverley, (flat roof, middle right of the photo below) is named in honour of Sir Walter Scott's first novel of the same name. He also wrote Rob Roy and Ivanhoe. The Scott Monument (dark ornate structure on the left) on Princes Street is the tallest monument to a writer in the world. Pedestrian only Rose Street runs parallel to Princes Street and its pubs and bars have been haunts of writers (including Scott) for decades. Notice the Scottish rose design inlay in the cobble stones. Another lovely feature is the trash bins. Who knew such mundane items could be a thing of beauty? Each is inscribed with words by a Scottish author. Further along Rose Street there is a series of copper windows depicting the poem 'BeachComber' by George MacKay Brown. From there we visited the Portrait Gallery. This is a shot of the impressive main entrance area from the second floor balcony. In Old Town, just down a wee way from the Castle is Victoria Street. It's a combination of concave and convex Victorian buildings facing each other. We recognized them from one of our favourite British TV series, Case Histories (based on the book by Kate Atkinson). Next was Greyfriars Kirk (Church), seen through the passageway to the left of GreyFriars Bobby Pub. The Kirk was the first church built in Edinburgh after the Reformation. With permission from Mary Queen of Scots in 1562 the Town Council took over the grounds to use as a cemetery. The story of Greyfriars Bobby refers to the police dog owned by Constable John Gray in the 1800s. The policeman got him as a pup and naturally named him Bobby. Together they patrolled Edinburgh's streets until 'Auld Jock' died of TB and was buried in Greyfriars Kirk. Bobby mourned his masters loss and spent most of the rest of his life in the Burial Ground. 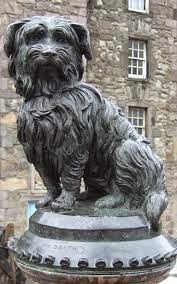 For that reason he became known as Greyfriars Bobby, and when he died he was buried there as well. Take a look at how these Cubist style sculptures are used to illustrate how stone age man adorned their bodies with jewellery. Of course, children might not appreciate the artistic approach, but there's still plenty more for them to see and do in the nature section. To the left of where the people in the above photo are standing is an expansive plateau. From here the views of the city, Firth of Forth and the Scottish highlands in the background are spectacular. Edinburgh captured our hearts. We did our best in seven short days to do it justice, but we failed miserably. No worries. We hope to return one day for a longer visit. Soon!